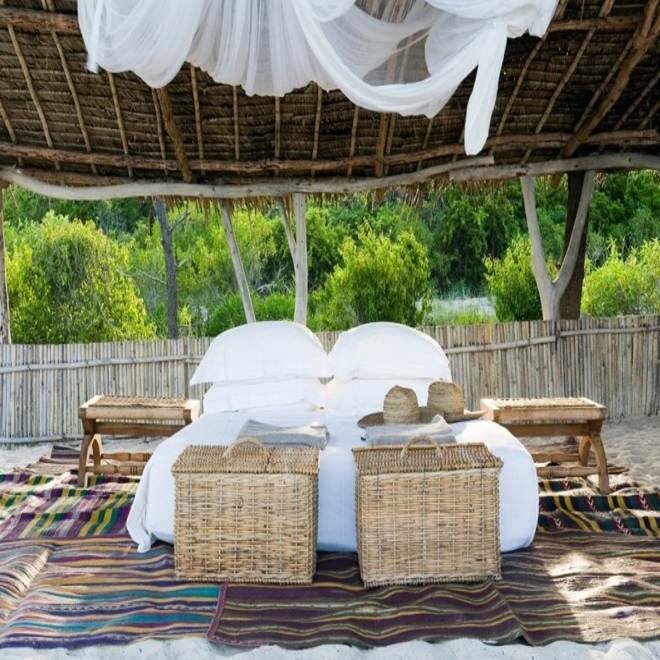 The Vamizi resort is the only occupant on Vamizi Island off Mozambique. No need for shoes or worries during a stay here. We're biased, but we believe the best part of a wedding is the excuse to take a splashy, all-out vacation after the big to-do. Case in point: These seven honeymoon suites, all from Condé Nast Traveler-approved properties. One thing is certain about a stay at the Vamizi: You’ll spend it barefoot. The resort (the only occupant on a 7.5-mile island) subscribes to a “No News, No Shoes” policy that shouldn't be hard to follow — you can sunbathe au naturel on your villa’s private beach and dine al fresco among Samango monkeys and green turtles. Five pavilions — a glassed-in living room, garden, landscaped deck, and two-tiered swimming pool — make this villa overlooking the Ayung River Gorge feel completely separate from the rest of the resort (which is actually only a minute away). It doesn’t hurt to have nice things to look at besides each other — say, a Harry Potter-esque living portrait of Margaret Thatcher that changes throughout the day. If that seems too strange, the suite also has a grand piano, a gaming table and two plasma TVs. Oh, and the Eiffel Tower's right outside your window. This massive villa comes with an indoor/outdoor bathroom, two kitchens and three pools — that’s whirl, dipping and infinity. Plus, a valet, chef, housekeeper and grounds person are on hand to attend to it all. The Langham's signature honeymoon suite comes with a color-therapy infinity bath, a view of All Souls Church … and two bedrooms (a master and ensuite). You two can have the entire view of the Hong Kong skyline and Victoria Harbour all to yourself — or at least that’s how it will feel if you opt to sleep under the stars on the private terrace, right next to the Jacuzzi. We imagine Sea of Cortéz looks especially divine viewed from both sides of a wraparound infinity-edge Jacuzzi. When it's time to dry out, the Casita Suite has a daybed and multiple chaise lounges — and a second Jacuzzi in the bathroom, for good measure.